West Liberty-Salem’s Katie Hartsel (left) takes the baton from Grace Adams in the girls’ 4x800 relay race at the Graham Invitational on Thursday. ST. PARIS – Graham hosted the Graham Track Invitational on Thursday, which featured several top area schools, including all five from Champaign County. 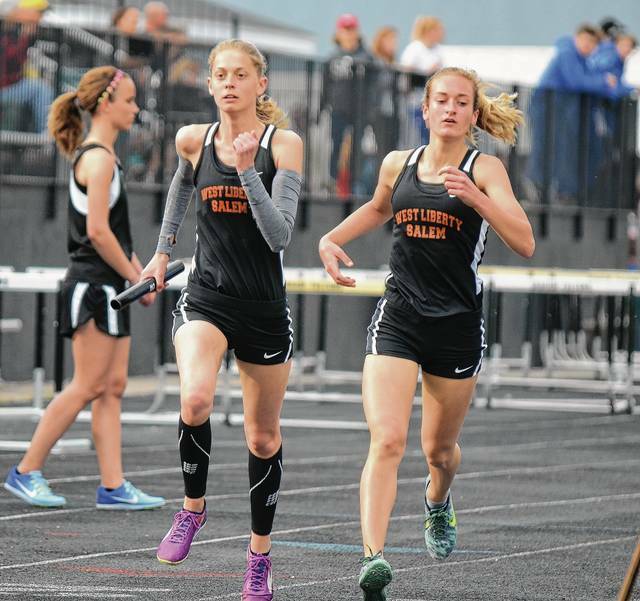 Winning events from local schools were Ashton Arnett (GHS, 100H), Sam Strickland (WLS, 800), Kayla Tullis (GHS, shot put), Lydia Moell (WLS, pole vault), the WL-S girls 4×200 team of Taylor Lauck, Megan Dillon, Lydia Moell and Janie Kopus and the GHS boys 4×400 team. Taking second were Lydia Moell (WLS, 300H), Brandon Wolfe (WLS, long jump), Kayla Tullis (GHS, discus), Jenna Magnuson (WLS, shot put), the GHS boys 4×200 team and the WL-S girls 4×400 team of Taylor Lauck, Grace Adams, Payton Umphries and Janie Kopus. Earning third were Addy Johnson (WLS, 100H), George Bugg (GHS, 110H), Grace Adams (WLS, 1,600), Mitch Moyer (UHS, 300H), Janie Kopus (WLS, high jump), Megan Dillon (WLS, pole vault), the WL-S boys 4×200 team of Christian Parker, Brandon Wolfe, Ian Wolfe and Raiph LeVan and the GHS boys 4×100 team. BELLEFONTAINE – Benjamin Logan defeated Triad, 6-4, in non-league baseball on Thursday. Jacob Greve was 2-for-4 for the Cardinals. Triad (7-1, 2-0 OHC) will play a doubleheader at North Union on Saturday. ST. PARIS – Urbana defeated Graham, 5-1, in CBC baseball on Thursday. Graham committed four errors in the contest. Kaleb Bowdle earned the win with 10 strikeouts for the Hillclimbers and Noah Ziegler had 2 RBI. Graham beat Urbana, 12-0, in five innings of CBC softball on Thursday. For the Falcons, Alli Neeld was 2-for-3 with a pair of RBI, Mackenzie Smith was 3-for-3 with an RBI, Madi VanScoy was 2-for-4 with 2 RBI and Madison Bryant was 2-for-4 with 2 RBI and a double. Bryant also threw a no-hit shutout for the win and appears to be showing no ill effects after getting hit in the head by an errant throw earlier in the week. Sidney Easter took the loss for Urbana, striking out four batters. Graham (10-1, 6-0 CBC) plays at West Liberty-Salem on Saturday. MILFORD CENTER – The Mechanicsburg boys and girls teams each finished third at the Fairbanks track tri-meet earlier this week. Placers for the M’burg girls included – 100m dash: Emily Wilson 3rd (13.84); 400m dash: Chloe Jacobs 3rd (1:15); 1,600m run: Stephanie Dietrich 3rd (6:16.9); 3,200m run: Dietrich 1st 13:45; 4x100m relay: Rilee Smith, Chloe Jacobs, Gabby Terry, Grace Layne 3rd (58.36); 4x200m relay: Wilson, Gloria Terry, Gabby Terry, Layne 3rd (2:04.97); High Jump; Ava Mayo 2nd (4-2); Long Jump: Wilson 1st (14-9); Mayo 2nd (12-9); Shot put: Shannon Barch 3rd (24-2.5) and Discus: Barch 1st (89-09). Placers for the M’burg boys included – 200m dash Cannon Propst 3rd (25.09); 400m dash Dustin Knapp 3rd (57.72); 800m run: Gavin Erwin 1st (2:13.4); 3,200m run: JP Kent 2nd (12:27); High Jump: Aiden Shelton 3rd (5-2). West Liberty-Salem’s Katie Hartsel (left) takes the baton from Grace Adams in the girls’ 4×800 relay race at the Graham Invitational on Thursday. https://www.urbanacitizen.com/wp-content/uploads/sites/36/2017/04/web1_HartselAdams041317.jpgWest Liberty-Salem’s Katie Hartsel (left) takes the baton from Grace Adams in the girls’ 4×800 relay race at the Graham Invitational on Thursday.